Bookshelves are a ubiquitous feature in every home – it’s virtually impossible to go about decorating your interiors without one. These bookshelves come in a wide variety – including corner shelves, feature shelves, side shelves, single piece shelves, and so many more; many even customized to fit a certain style or look. Most of the time, they end up becoming the face of your interiors, and here is where the problem actually begins: many people are not able to carry out a proper arrangement for their bookshelves. In this article, we explain 6+ bookshelf arrangement methods and ideas to decorate your bookcases in style. The thing is, you cannot simply throw down some helter-skelter decoration pieces on the shelves and call it a day. The fact is, bookshelf arrangement is a very particular art that needs to be followed up to a T. Furthermore, there seems to be a general misconception about bookshelves; that they are designed to only feature a book collection. Yes, it is called a bookshelf, but no you do not have to limit yourself to simply arranging book spines. 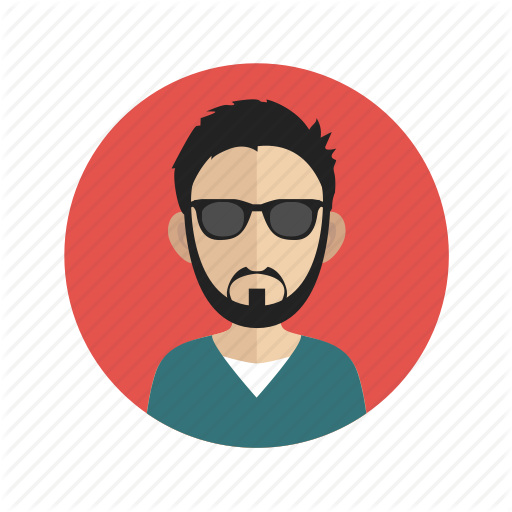 You can try placing personal photo frames, flower arrangements, collections, paintings; well, the beauty is in disorder or asymmetry. Further, we’ll be featuring some awesome ideas to give you a crash course in the science of bookshelf arrangement. Scale: The scale of all the accessories you’ve chosen for your bookshelf is very important. These have to complement the size and proportion of the shelf tiers. Balance: After you’ve selected everything you want to display on your bookshelves, it’s time to consider the arrangement. Note that there should be a visual balance between everything you put on each tier. Colors: The design and color of your trinkets and accessories has to be complementary. Yes, you can go for contrast, but make sure the colors look good together. Stacking: If you want to display books on your shelf, then it’s better to explore various stacking options; horizontal, vertical or alternating. Displays: You can accessorize with beautiful decorations and pieces that hold sentimental value (i.e. cards or photo frames). However, you have to keep the scale and proportion of the shelf in mind. Mixing & Matching: This step is all about getting creative with your arrangement. You cannot simply place a frame next to another frame. Just like color contrast, it is important to create visual contrast between accessories and decoration pieces. Note:- If you are looking for a similar White Bookshelf, take a look at our review of White Bookcases Collection. Your favorite books; maybe the top three right on the top tier. Tall decoration pieces; they’ll give the overall arrangement more character. Photo frames; showcase some of your best memories in a classic photo frame. A small plant; indoor succulents are a raging trend these days. Artsy baubles; some vintage trinkets and bauble to add some personality to your shelf. Now that you know all the things you can carry out an arrangement with and understand the basics, it’s time to look at some notable ideas. These are pretty mainstream, which means that their success rate is pretty high. Any first timer can get the gist of it even at the first try. The first one is punctuating a stack of books; you can lay them down horizontally and punctuate their spines with a shiny trinket. The second one includes using beautiful baubles as bookends; these can be paperweights, a small planter or even an artsy decoration piece. The third one layers horizontal and vertical stacks of books side by side to give a more stylistic appeal. All three of these ideas are extremely fool proof and very attractive. You may like: our article on ladder shelf arranging ideas. Now that you’re aware of some of the basics, it’s time to look at the big picture. Your bookshelf is going to be a feature object in your interior design. Most of the furniture will be arranged to highlight its symmetry. So let’s look at the Inverse Geometric Arrangement technique, which you can use to better the overall outlook and aesthetic of your bookshelf. The top two tiers should be arranged in an equilateral triangle form. The third tier will feature an isosceles triangle formation. The fourth tier will be a combination of two parallel right angled triangular forms. Lastly, the fifth tier feature another equilateral triangle arrangement. The best part about this arrangement technique is that you can follow any alternating tier arrangement depending on the size of your shelf. You can even skip one or two if your shelf is smaller, and add another one if it is larger according to instinct. 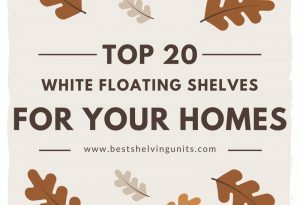 Read: Our review of Top 15+ Floating Wall Shelves for your home. Since there are quite a lot of genres available in shelving these days, you cannot simply hold all of the above principle stringent for simply feature-length shelves. 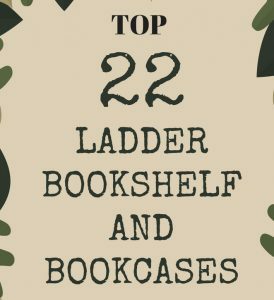 So, let’s take a look at what you can do in order to spruce up your mid-length bookshelf. First of all, you can use it in the capacity of a console. This means that it will be set up smack in the middle of a feature wall. While you can use all the basic design principles to arrange the bottom tiers – balance, symmetry, mixing-and-matching, etc. – it is actually the top tier that you have to pay special attention to. Use a large picture frame or artwork to cap off the top tier. Then you can complete the look by arranging decorative objects like photo frames, lamps or even candle sticks on the top to give a holistic aura to the setting. Note:- If you are looking for a similar shelf, take a look at our review of Tables with Shelf Underneath. Here’s a best kept secret: no one will ever tell you that in-built bookshelves should feature a ‘Frame’ effect. This basically means that the center of the bookshelf should frame a certain angle or look, which becomes the highlight of your décor. It can be a part of the shelf itself, or your shelf can be designed around it. For example, two tall shelves built on either side of a doorway will invoke the ‘Frame’ Effect on the door portal. But in case you’re decorating a standard in-built bookshelf, then make sure that the center becomes the highlight of your arrangement. Maybe it can be done by enlarging its size, or maybe it can be done by emphasizing the focal points of your arrangement. It completely depends on the location, size and built of the bookshelf. Read: Our article featuring Bookshelf ideas for small spaces and apartments. As you can see, there are a lot of ways you can arrange your bookshelf decoration, if you follow a simple construct. We have explained 6 different bookshelf arrangement ideas, which covers core aspects of bookcase arrangement science. There’s a lot of leeway to be flexible with your design, but only while remaining in the boundaries your arrangement will have an impact and attractive look.